You are here: Home / The Home / How to Clean a Mattress… It’s Dirtier Than You Think! How to Clean a Mattress… It’s Dirtier Than You Think! We spend on average 8 hours a day on our mattress, but it’s one of the last things we think about to clean! Learning how to properly clean a mattress can make a big difference to the quality of your sleep. I bet you didn’t know that your mattress is gross…! Yep, I don’t mean to be rude, but your mattress is probably much dirtier than you realize. The National Sleep Foundation says that the average lifespan of a mattress is 8 years, although some types, like a foam mattress, can last much longer. That means the average mattress should last you for 2,920 nights! Or 23,360 hours! And yet, most of us don’t ever think to clean our mattress. The only time you might think how to clean your mattress is when there has been an “accident” in the bed. Step 5: Time to Vacuum… again! So, yes, we spend a lot of time on our mattress. But why is cleaning it so important? Well, let’s take a look at some of the gross stuff that might be on your mattress. “Wait, wait… WAIT” you might be saying. I always use a fitted sheet, so how is the gross stuff getting onto my mattress? Well, a sheet isn’t completely solid. It’s made of a woven material. Yes, it’s going to keep a lot of larger particles from getting through to your mattress, but the smaller stuff (the REALLY yucky stuff!) goes right through it! Are you ready to find out what this “gross stuff” is? It’s not for the fainthearted! Dirt – OK, this one is pretty expected. Unless you shower every single night before bed, then there might be some dirt on your mattress. Sweat – Semi-gross. We all sweat different amounts. Maybe in summer when your AC is broken you sweat a bit more! And Ladies, during our monthly cycle there are some days when our body temperature is higher and we will sweat more! Urine – Getting grosser! I think this one doesn’t really need a further comment! “Other” bodily fluids – Errr… yeah! Dust Mites – Yep, definitely in the “gross” category now! Dust mites are tiny, tiny (0.4 millimeters in length… basically invisible to the human eye) and they feast on dead skin cells! The best bit? They poop! Yes, they produce “feces” that many people are allergic to! Mold or Mildew – Yep, you can get mold or mildew on your mattress too! This is especially a problem in hot and humid places (like Florida… where I live!). You might not even realize you have it, because it can often just look like a dark stain. Bed Bugs – OK, these are the worst in my opinion! These little critters will feed on your blood and leave you with a nice itchy bite afterward! They are difficult to completely treat, and sadly, the advice in this post won’t help completely remove an infestation. You’ll need expert help for that! 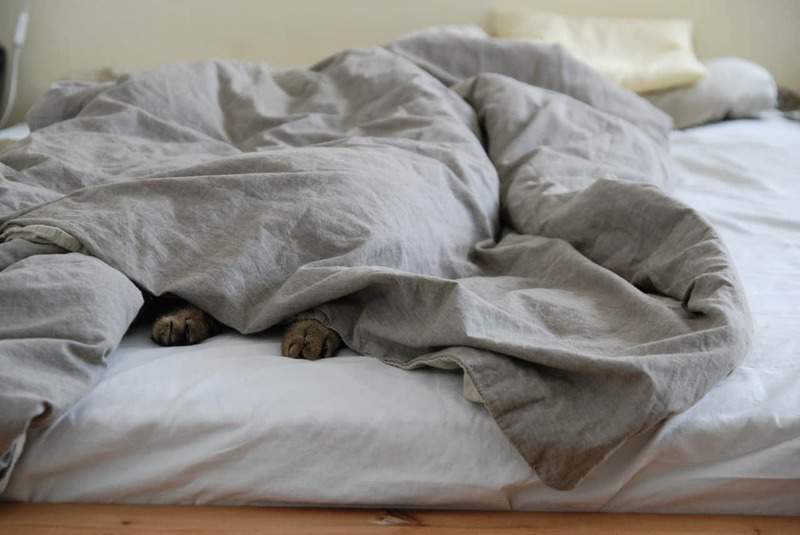 Random Fact: Did you know there are bed bug sniffing dogs? Their job is to go into buildings and find all the bed bugs! OK, so if just the list of gross stuff on your mattress isn’t enough to have you racing off to clean your mattress, then maybe I need to explain some of the health problems this stuff can cause. Bed bugs have obvious health problems. No-one wants to have their blood sucked while they sleep (well, maybe vampires do, I don’t know). They can leave you with multiple, itchy bites that are uncomfortable. On the plus side, bed bugs aren’t known to transmit any diseases like some other biting bugs, so there is that! As I mentioned above, dust mites can cause a lot of problems. It’s not the mites themselves, but their poop! The feces contains an allergen called “DerP1 that a lot of people are allergic to it without even knowing. Yeah… none of that sounds very pleasant! Now do you see why it’s important to learn how to clean a mattress?! 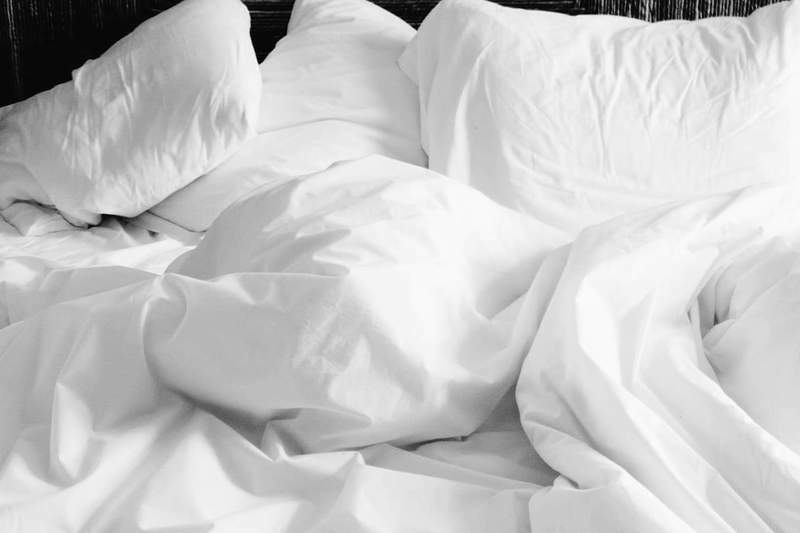 The urine, blood, sweat, and dirt on your mattress might not make you seriously ill, but they will have an effect on the quality of your sleep. All that gunk contributes to poor air quality which can dramatically reduce the quality of your sleep. … Clean mattress = Better sleep! Oh, and all that yucky stuff will make your mattress smell musty and funky too! OK, so now we’ll get down to it. The following steps will tell you exactly how to clean a mattress, so you don’t have to worry about any of the gross-ness mentioned above! Now, I’m all about the speed cleaning (seriously, I’m obsessed with quick cleaning hacks – check out my Quick Cleaning Tips for Busy People post!). But you need to take your time cleaning your mattress. The good news is, that you only need to do it about once every 6 months. OK, this might be a bit of a no-brainer. But you need to remove your sheets and bedding before you can clean your mattress! Why not wash your sheets while you’re at it? Next you want to grab the best vacuum you can lay your hands on! The stronger the suction, the better (remember… dust mite poop!). Using an upholstery attachment, vacuum the surface of your mattress. This might take a bit of time (especially if you have one of those fancy big Californian King-sized beds! ), but it’s worth doing it properly. You’ll also want to use a crevasse tool to get into all the little folds and seams on the mattress – those are the places that the bed bugs and dust mites love to hang out! 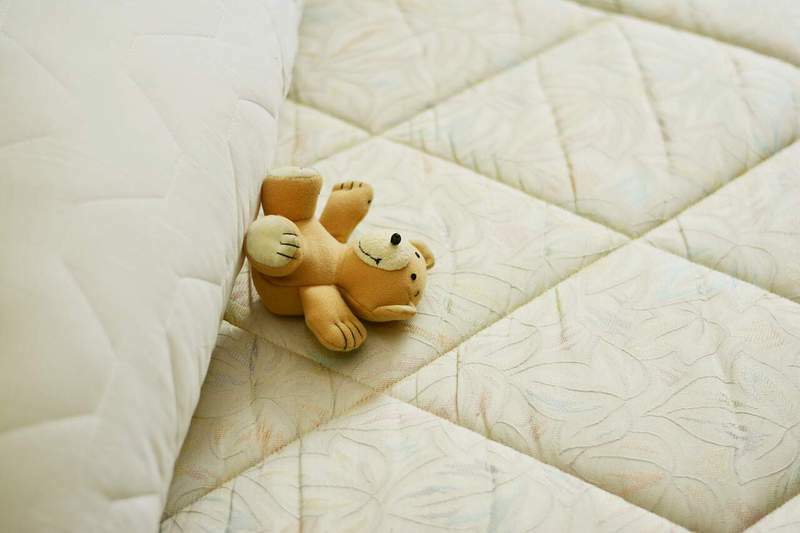 Now that you’re done with the vacuuming, it’s time to treat those yucky mattress stains. Come on, don’t be too proud… we all have mattress stains! It’s OK, you’re human too! There’s so many different types of stains and so many ways to treat them, that I could write a whole post just on those… oh wait! I DID write a post all about how to clean mattress stains! Hop on over there for a more detailed look at stains and how to clean them. Most of the stains on your bed are likely to be “biological”. Meaning urine, blood, sweat… errr… “other” bodily fluids. The best way to treat those is with a mixture of hydrogen peroxide, Dawn dish soap, and baking soda. Mix them together (don’t use too much dish soap, just a few drops are enough) and use a spray bottle to spritz your bed. Then rub or bloat with a clean rag. For full instruction go to my How to Clean Mattress Stains post. If you have really tough stain or a larger urine accident, then you could also use a pet urine enzyme cleaner. My absolute favorite is Anti-Icky-Poo Cleaner and I have 4 dogs, 4 cats, and 3 children… so I know a thing or two about enzyme cleaners! Yep, stupid name, but this stuff is amazing! It’s not cheap, but a small amount goes a long way. They even have a phone number that you can call, explain your problem and they tell you EXACTLY how best to use the product! How awesome is that? We’re about half way through cleaning a mattress now. The next step is sprinkling the whole bed with baking soda. This stuff is great – it absorbs odor and also oils from the mattress. Leave it to sit for at least 10 minutes (but the longer the better), so it can really do its thing! I would say that this is an optional step, but your bed is covered with baking soda, so yeah… you need to vacuum it again! But once you’re done with the vacuum, you then have a nice clean, fresh smelling mattress! Now THAT is How to Clean a Mattress! OK, so officially, your mattress is nice and clean now. But there are a few things you can do to help keep it clean and fresh smelling. If you are able to, then it’s a good idea to flip your mattress every 6 months. This not only helps the mattress last longer, but it helps with the build-up of yucky stuff! Some types of mattress can’t be flipped, like pillow top ones, so check before you try to! My mother always used to say “An ounce of protection is worth a pound of cure” and it’s true for mattresses too! To keep your mattress clean and “biological waste” free, then you can invest in a good quality mattress protector. You’ve spent hundreds (even thousands) of dollars on your mattress… help it last longer with a good mattress protector! If you do decide to use a mattress protector, then make sure you throw it in the laundry with your bedding from time to time too. If this post has inspired you to start regularly cleaning your mattress, then my job here is done! A clean mattress really will make a big difference to the quality of your sleep and, therefore, the quality of your life! Yep… I’m changing lives! I hope you find it useful. Nighttime allergies are the worst! If your mattress is older, then it might take a couple of treatments before you notice a big difference.